Accent the hallway perfectly or set up a quiet space for study in your bedroom with the Mission Style Laptop Desk. 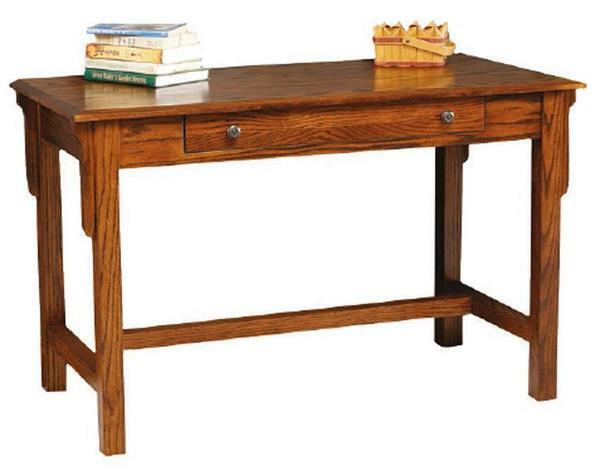 This beautiful solid wood desk is handcrafted for your home with the finest woods available, sourced here in America. With a basic nature that allows the beauty of the wood to shine, this mission style desk offers a 48" width and stands 30" high. Use this wood desk for work on your laptop or it can also serve as a decorative accent table in the hallway or foyer, providing a space for incoming and outgoing mail and keys to be stored. The simple beauty of mission style furniture works well in both traditional and contemporary decor. Browse more of our mission furniture for other areas of your home. Customize this mission desk with your choice of wood and stain. Order samples to work with at home from our stain sample collection.